Maria has been blessed with the gift of psychic ability. She provides guidance as you travel along life's journey - treating everyone with kindess, honesty, and compassion. I have had this ability all of my life. 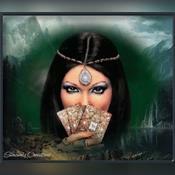 I have been doing psychic card readings for friends, family, and clients for many years. I cannot claim to be 100% I am not God - See what the cards see for you. Now I want to share my God given gift. "It is written that God said, 'I will send my angels to watch over you.' "In that sense, angels can be anyone in your life sent by God for a reason. "They come to protect you, to teach you, to help you, to love you. They come to change your mind and show you the way when you have lost it." Please leave me feedback by posting comments. maria515 has been a user of Keen since 2005. Getting Life Questions advice from maria515 through www.keen.com is safe, secure and confidential.